Dates are not only ridiculously tasty, but also very nutritious. They’re full of fiver, potassium, iron, manganese, and copper. Hence, they’re the perfect superfood in itself already if you ask me! 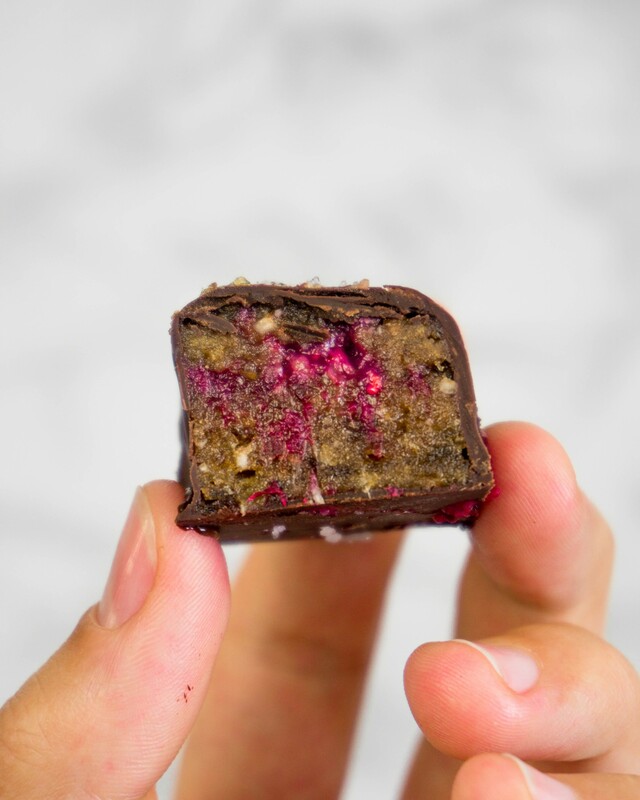 Back to the Salted Caramel Raspberry Bites. Dates for themselves are amazing but sometimes you just need a little bit more than that. 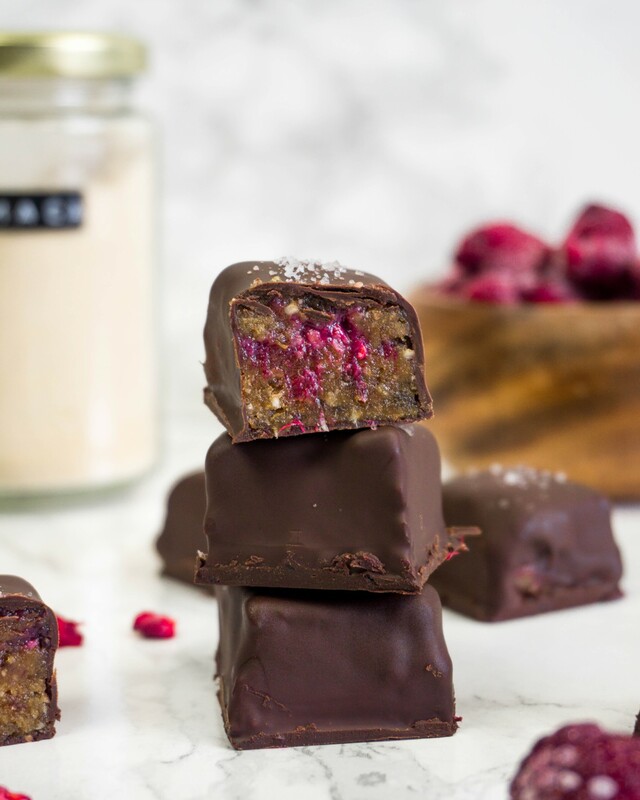 Now if you combine dates with tahini, raspberries, almond flour, dark chocolate and a bit of maca powder you get heavenly snacks that are delicious and healthy! 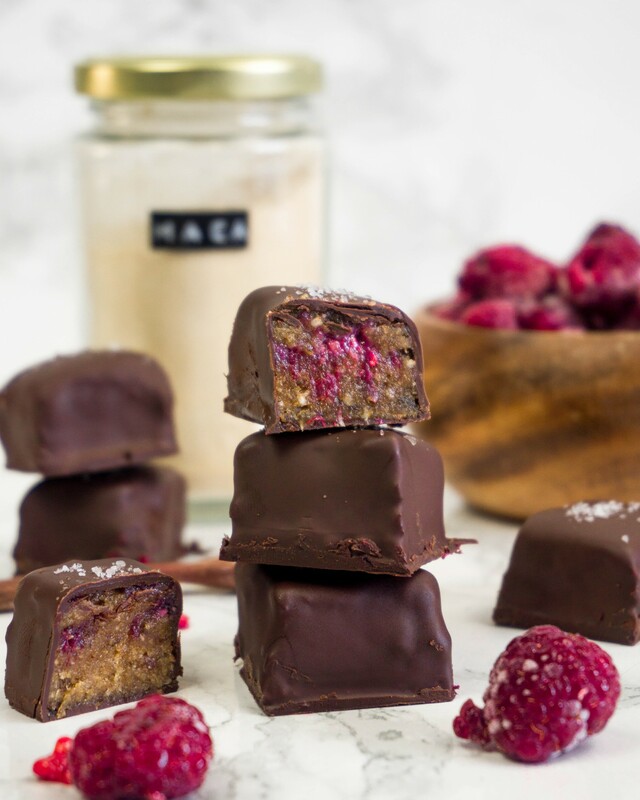 Have you ever tried maca powder? It’s totally optional in this recipe but I have been adding it to almost everything lately (smoothies, granola, oatmeal). If you have never heard of maca, let me give you a quick summary. Maca is a root vegetable from the Andes of Peru and has been used for its medicinal properties for thousands of years by the natives. It’s considered an adaptogen – meaning it’s a natural substance that helps the body adapt to stressors like a busy schedule, demanding job or illness. A few of the many benefits of maca include improvement of energy levels, mood and memory, boosting of fertility (male), enhancement of female sexual health, and balancing of estrogen levels. 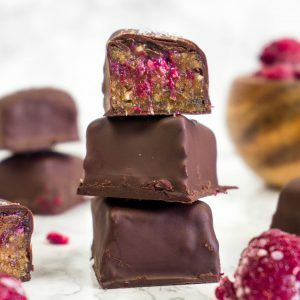 I’m absolutely loving these little bites of heaven as it’s one of those recipes where you can swap ingredients to whatever you have on hand and they will still come out amazing! Add the pitted dates and the tahini to a food processor or high-speed blender and pulse. Add in the oat/almond/coconut flour, salt and maca powder and pulse/blend until you have a dough-like consistency. Line a loaf/brownie tin with parchment paper. Transfer the dough to a bowl and add the raspberries. Use your fingers to roughly mix in (this is kind of messy) and place the dough into the tin. Press down evenly into the desired height and shape and freeze for 30 minutes. In the meantime, melt the chocolate. 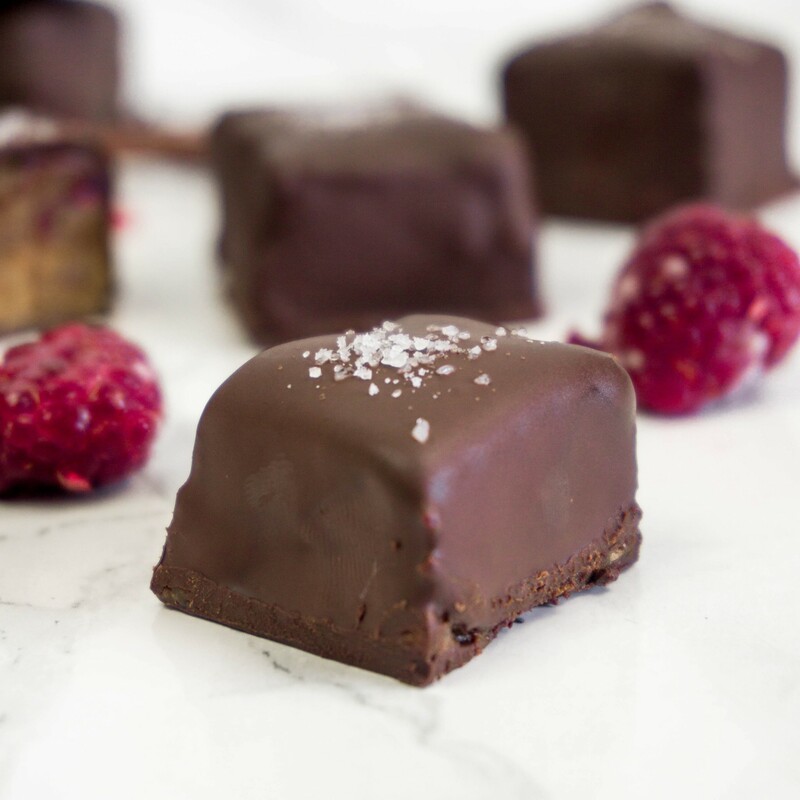 Take out the tin and cut the dough into small bite-sized cubes. Cover them with the chocolate and sprinkle a tiny bit of sea salt on top before placing back into the freezer to firm. HI Kirsten, I did make these a few weeks ago and they were delicious. Mine were a bit soft in the middle, so I think I might tweak the recipe a bit, but I really enjoyed them, so thanks for sharing. Utterly delicious, and very quick and easy. Thanks for this great recipe!